Are you looking for a study guide on the Review of Thoracic Imaging in Respiratory Care? If so, then you are definitely in the right place. The practice questions listed below cover everything you need to know for Egan’s Chapter 21 in order to ace your exams. This information also correlates well with Patient Assessment Chapter 11. Are you ready to get started? Let’s dive right in! One more thing. If your Respiratory Therapy program is like mine, then you probably use the Egan’s Workbook. Don’t get me wrong, I love Egan’s and their workbook can be helpful at times. The problem is, it takes way too long to look up all the answers! I found that I wasted entirely too much of my time looking up the answers as opposed to actually studying and learning the material. 1. What is the definition of Radiolucent? X-rays that pass through low-density tissue (lung) strike the film more directly and causes the shadow to turn darker. 2. What is the definition of Radiopaque? 3. What 4 tissues are seen on an x-ray? Air, fat, water, and bone. 4. What are air bronchograms? Air-filled airways surrounded by infiltrates from filling of surrounding alveoli. 5. What is the air-fluid level? Straight, level border with air above in hydropneumothorax. 6. Is air radiolucent or radiopaque? 7. What is an alternate name for radiograph? 8. The AP view is taken with what? 9. What is the AP view positioning? The x-ray source is in front with the film behind patient’s back. 10. Are x-rays used in MRI? No, no they are not. 11. What is the bat’s wing appearance? Predominance of edema in the hilar regions with less edema in peripheral areas. 12. What is the best film for detecting small amounts of pleural fluid? 13. What is the best type of imaging for the mediastinum? 14. What is the best way to detect a solitary pulmonary nodule? 15. Is bone radiolucent or radiopaque? 16. Computed tomography angiography looks at what? It looks at the heart. 17. What is the conventional thickness of CT images? 18. What is a costophrenic angle? It is the arch of when the diaphragm and chest wall meet, and it forms a point. For the TMC Exam, if you see a question about a “blunted costophrenic angle”, know that the answer is Pleural Effusion. 19. Does a CT scan identify pleural fluid? Yes, it does this easily. 20. Does an emboli show up on a CT scan? 21. Does an ultrasound detect pleural effusions? Yes it does; even small ones. 22. Does the AP view have magnification of the heart shadow? 23. Will emboli show up on a radiograph? 24. What is the color of fat on a radiograph? It is slightly darker than soft tissue. 25. Fluid build-up in the alveoli causes what appearance? It causes peribronchial cuffing; Kerley B lines. 26. The heart shadow should not exceed what? 50% of the thoracic diameter. 27. How are blood vessels easily identified on the ultrasound? Compressibility of veins compared to arteries. 28. How does a CT scan visualize structures? It does do in cross sections. 29. How does the MRI work? Nuclei that have an odd number of protons and neutrons align themselves with the magnetic field and radio waves are used from the realigning nuclei. 30. 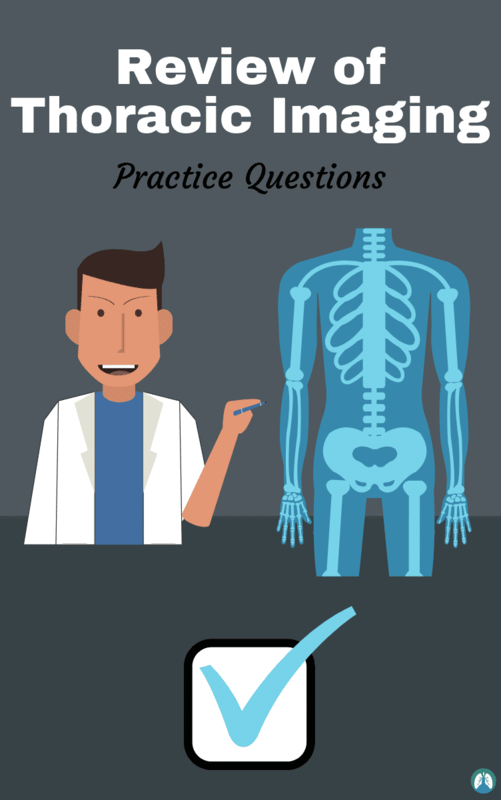 How do you determine if the patient is properly positioned? The spinous process is midway between medial ends of clavicles and in middle of tracheal air column. 31. How is a pneumothorax detected? Thin pleural line at the lung margin is missing the bronchovascular markings between the lung margin and the inner aspect of the chest wall. 32. How is fluid in interlobar fissure diagnosed on a chest radiograph? Lens-like, elliptic shape on the PA/lateral projection. 33. How is pulmonary edema seen first? Blurring of the normally distinct walls of the hilar blood vessels. 34. How much fluid can be detected on the lateral decubitus view? 35. How much fluid is required to blunt costophrenic angle from pleural effusion on the frontal view? 36. How much fluid is required to blunt costophrenic angle from pleural effusion on the posterior view? 37. How much of the lung is overlaid with bone? 38. How much pleural fluid is normally present? 39. If more than 7 anterior ribs are visible above the diaphragm, what is present? 40. Increased pressure in pulmonary veins is seen as? Enlarging blood vessels to the lung apices. They are patchy white shadows. 42. On an MRI, blood appears what color? 43. On an MRI, bone appears how? 44. Is the diaphragm imaged on a radiograph? 45. Is the intralobular septa invisible on a radiograph? 46. What are Kerley B lines? Edema in septa separating lobes becomes evident and the septa thickens. Thin lines against the pleural edge running perpendicularly away from the pleural edge. 47. Kerley B lines are often seen in what type of edema? 48. What is the lateral decubitus view? Frontal view taken as the patient lies on the side of the suspected effusion. 49. What does MRI stand for? 50. Normally, airways are invisible where? In the outer 2/3 of the lung. 51. What is nuclear medicine? Scanning radioactive material within a patient after inhalation/injection of radioisotopes. It is used for V/Q scans, and Positron Emission Tomography (PET) scans. 52. Should the patient be sitting or standing for the PA view? 53. Patients with long-standing heart failure have what? Enlargement of the heart or pleural effusion. 54. Does the PA view minimize or maximize the magnification of heart? 55. What does PET stand for? 56. When do we do PET scans? To localize tumors and metastases. 57. Can the pleura be seen on a conventional chest radiograph? No, no it cannot be seen. 58. Pneumonia and a bleeding lung cause identical what? Patchy opacities that coalesce over time. 59. Proper exposure should show what? Intervertebral disc spaces through the shadow of the heart, and blood vessels in the peripheral regions of the lungs. 60. What are the radiographic signs of cardiac decompensation? Cardiac enlargement, Pleural effusion, Redistribution of blood flow to upper lobes, Poor definition to central vessels (perihilar haze), Kerley B lines, Alveolar filling. 63. What are reticular infiltrates? 64. What is a silhouette sign? Obscuring of the margin of adjacent structures of the same density. 65. Soft tissue and water density absorbs how much of the x-ray beam? 66. What are the steps in reviewing a radiograph? Identify the name, Check the side, Review technique and quality, Systematically review anatomic structures. 67. What are the structures that are imaged on a radiograph? Bones, soft tissue, lungs, pleura, heart great vessels & mediastinum, upper abdomen, lower neck. 68. Ultrasound is used to what? It is used to evaluate the heart and pleural fluid and guide the placement of central and arterial catheters. It is useful in separating pleural fluid from solid tissue. 69. What absorbs less x-ray than soft tissue? 70. What allows blood vessels to be distinguished from soft tissue in CT scan? The injection of iodinated contrast material which makes blood denser, radiopaque, and white. 71. What is used to assess the correct endotracheal tube position? 73. What can help diagnose a pneumothorax in a supine patient? A decubitus or cross-table lateral radiograph. 74. What can help diagnose a pneumothorax when it is difficult due to bullous emphysema? 75. What does a CT scan evaluate? Lung nodules/masses, Great vessels of the chest, Mediastinum, and Pleural diseases. 76. What do you assess first on lung evaluation? 77. What film helps clarify lung abnormalities? 78. What indicates end of the endotracheal tube? 79. What indicates good inspiratory effort for a good-quality chest film? Visualization of 6 anterior/10 posterior ribs above the diaphragm. 80. What is imaged pertaining to lungs? 81. What is the first sign of a left-sided pleural effusion on an upright chest radiograph? An increased distance between the inferior margin of left lung and stomach gas bubble. 82. What radiograph should you obtain for a pneumothorax? 83. What views show the costophrenic angle? 84. When can the visceral pleura be seen on a chest radiograph? When the pleural surface is parallel to the x-ray beam, it can be seen separating the lobes because it is contrasted with aerated lung. 85. When may a radiograph appear normal in respiratory failure? 86. Where is the AP view usually taken? 87. Where is the PA view performed? 88. Why are ultrasounds rarely used for lungs? 89. Why can pleura not be seen on conventional chest radiograph? They blend into the water density of chest wall, diaphragm, and mediastinum. 90. Why is there magnification of the heart shadow in the AP view? The heart is closer to the x-ray. 91. What are CT scans used for? Lung nodules and masses, greater vessels of the chest, mediastinum, and pleural disease. They are the shadows caused by the fluids building up and are often patchy. 93. What are the four tissue types that are visible on X-Rays? Air (radiolucent or black), Fat (dark grey), Soft tissue (grey), and Bone (radiopaque or white). 94. What is a contraindication for using an MRI? 95. What is a CT Angiography? It is a way to do CT scans of the pulmonary vessels and heart to detect for pulmonary thromboemboli, and is an alternative to routine coronary angiography. 96. What is an air bronchogram? The outer 2/3rds become visible when filled with infiltrates and is a hallmark of air-space-disease. 97. What is an air-fluid level? It is an area where a straight level border between air and fluid can be seen in a space. If it is found in the pleural space it indicates a hydropneumothorax. 98. What is the best view for detecting small amounts of pleural fluid? Lateral Decubitus View; as little as 5 mL of fluid can be detected. 99. What is the costophrenic angle? The arch diaphragm and chest wall meet to form a point. If it is blunted — think pleural effusion. 100. What is the most common chest film finding in critically ill patients? 101. Why is the PA view preferred over the AP view in regards to the heart? The heart is less magnified and it is of better quality. 102. On a standard x-ray study of the chest, which of the following are the most common two views? The heart shadow on the AP view is larger. 104. Which of the following has the greatest radiodensity? 105. A possible nodular anomaly is present in the right upper lobe on a PA film, but partially obscured by the clavicle. What view might show the anomaly better? At the level of the 10th rib. 107. When evaluating a PA film of the chest, you note that the right costophrenic angles are blunted. What does this suggest? Presence of a pleural effusion on the right. 108. When evaluating a PA film of the chest, you note that in the upper lobe there is a 1 cm wide sliver along the lateral margin, descending from the apex, merging with the ribs at the 3rd rib. This narrow sliver is very black and devoid of vascular markings. What does this indicate? At a point 2-3 cm above the carina. zimage the perfusion of the lung. 111. What does this indicate: Concave Superior Interface? 112. What does this indicate: Obliterated Costophrenic Angles? 113. What does this indicate: A Reticulogranular or Granular Pattern? 114. What does this indicate: Flattened Diaphragm? 115. What does this indicate: Ground Glass or Honeycomb Pattern ? 116. What does this indicate: Radiolucent? 117. What does this indicate: Scattered Patchy Infiltrates? 118. What does this indicate: Fluffy Infiltrates? 119. What does this indicate: Plate-like or Patchy Infiltrates? 120. What does this indicate: Wedge-shaped Infiltrates? 121. What does this indicate: Butterfly or Batwing? 122. What does this indicate: Air Bronchogram? 123. What would a normal chest x-ray show? The trachea is in the midline, bilateral radiolucency, with sharp costophrenic angles. 124. Where should the tip of the ET tube be positioned on a chest x-ray? Below the vocal cords and no closer than 2 cm or 1 inch above the carina. This is also the same level of the aortic knob or aortic arch. If it is above the clavicle, it is too high. 125. Where should the pulmonary artery catheter appear? In the right lower lung field. 126. Where should the central venous catheter be placed? In the right or left subclavian or jugular vein and should rest in the vena cava or right atrium of the heart. 127. Where should the nasogastric tubes and feeding tubes be located? In the stomach 2-5 cm below the diaphragm. 128. Croup or laryngotracheobronchitis will look like what on an x-ray of the neck? It will look like a steeple sign, picket fence, or a pencil point. 129. What will epiglottitis show what on a lateral neck x-ray? Supraglottic narrowing with enlarged and flattened epiglottis and swollen aryepiglottic folds. This is known as a “thumb sign”. 130. What diagnosis would you have if your chest x-ray had infiltrates? 131. What diagnosis would you have if your chest x-ray had a consolidation? 132. What diagnosis would you have if your chest x-ray showed hyperlucency? COPD or an obstructive disease. 133. What does an increase in vascular markings indicate? 134. If vascular markings are absent, this would indicate what? 135. How would pulmonary edema show up on a chest x-ray? Fluffy infiltrates and it might have a butterfly/batwing pattern. 136. How would atelectasis show up on chest x-ray? 137. How would ARDS or IRDS show up on chest x-ray ? Ground glass appearance, honeycomb pattern, and diffuse bilateral radiopacity. 138. How would a pleural effusion show up on chest x-ray? Concave superior interface/border or basilar infiltrates with a meniscus. 139. Why do we worry about the distance from the film? It is important to consider because the closer the patient is to the source, the greater the magnification and distortion of objects seen. 140. When would we do an MRI? It is used in the evaluation of the hilar. It can better see hilar lymph node enlargement from enlarged hilar blood vessels than a CT scan. Also, it is better at seeing chest wall invasion by lung cancer (specifically pancoast tumor or superior sulcus tumor). 141. What is a PET scan? It stands for positron emission tomography and is used to diagnose cancers. The compound is injected into a vein and malignant cells will show. 142. What is pulmonary angiography? It is used to evaluate thromboembolic disease and is only used if the V/Q scan results are an uncertain definitive diagnosis. So there you have it! That wraps up our study guide on the Review of Thoracic Imaging in Respiratory Care. I hope that these practice questions can help you learn everything you need to know about Egan’s Chapter 21. Be sure to read through this information until you fully comprehend the material. Thank you for much for reading and as always, breathe easy my friend. And don’t forget, if you need help with your Egan’s Workbook, we looked up the answers for you so that you don’t have to. Check out our Workbook Helper to learn more.